Hilton Falls makes a scenic 10 metre drop over the escarpment beside the ruins of a thrice abandoned saw mill. We decided to visit the falls and investigate a section of the escarpment we had never been through before. We parked on the sixth line at the parking lot for the Halton Regional Forest Britton Tract and set off on an extended hike to the falls. 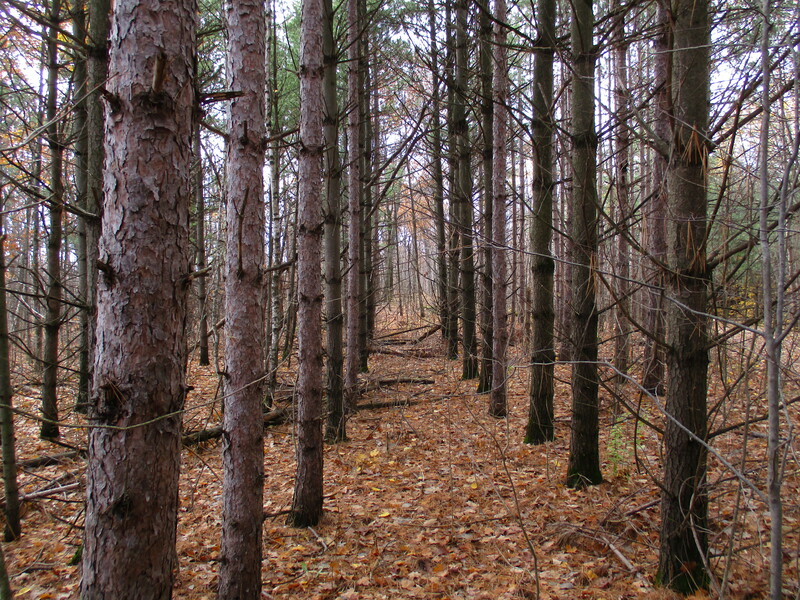 The Britton Tract has been managed by Halton Region since 1952 and contains the Bruce Trail as well as several side trails. 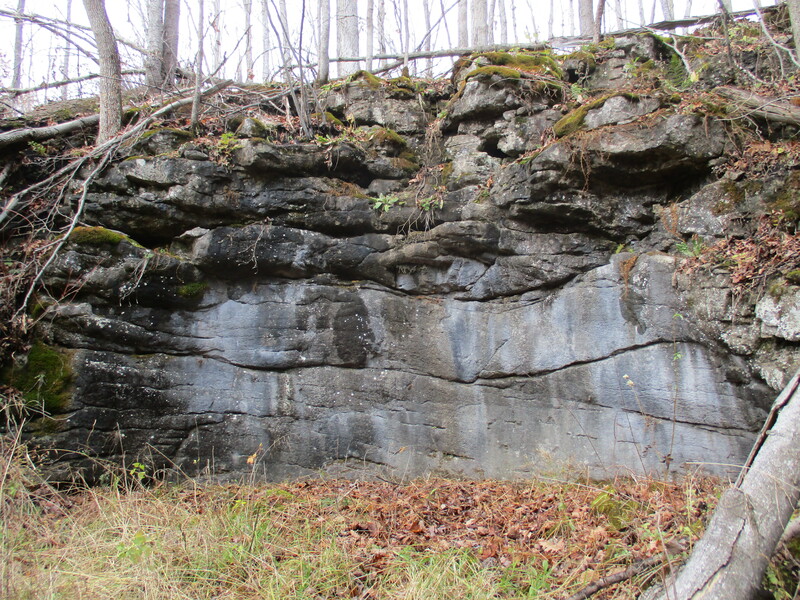 The escarpment here is dolomite which can hold water in pools close to the surface providing a large amount of water in streams and wetlands. It also leads to the growth of extensive amounts of moss on the rocks. The trees don’t tolerate the wet conditions and many fall before they reach their full size giving the forest a youthful appearance. The autumn meadowhawk, as implied by it’s name, is seen in late summer or fall. However, the name may suggest a bird rather than a dragonfly. 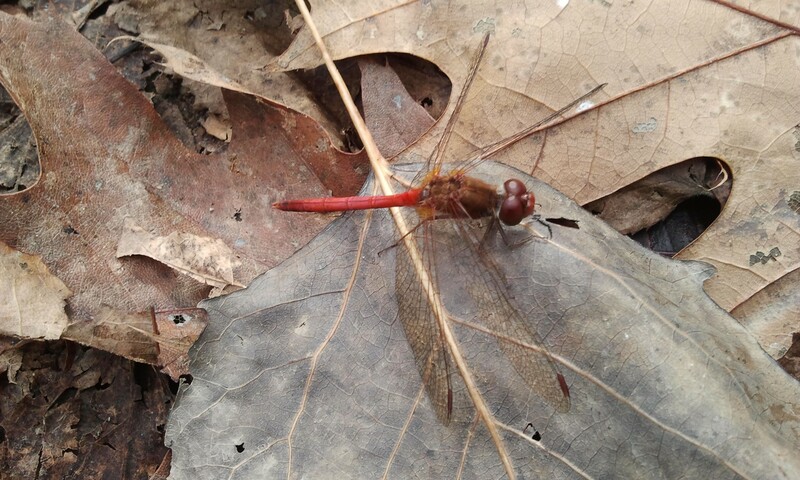 This dragonfly has relatively large eyes as compared to most members of the genus. They feed on insects including the beloved mosquito and they themselves are eaten by fish. Large Mouth Bass are known to catch them as they touch the water when the male and female are locked in the process of mating. It’s Latin name means “with rock” and refers to their habit of sunning themselves on the rocks along the shoreline of lakes and steams. Along the side of the blue trail we found a glacial pothole. These potholes generally are wider in the middle than either the top or bottom. Early concepts of their creation suggested that aboriginal people had carved them. Smaller ones supposedly being used for cooking. They are also called “Moulin Potholes” and are now believed to have been formed when water poured through a hole in a melting glacier and eroded the stone beneath. They range in diameter to over 25 feet and the one pictured below is about 15 feet deep. As we made our way through the woods we saw an old stone wall on the left of the path. Stone fences were the easiest solution for disposing of rocks during the annual clearing of farmland. This particular tract of land was difficult to farm and the fields have been left to go wild again. 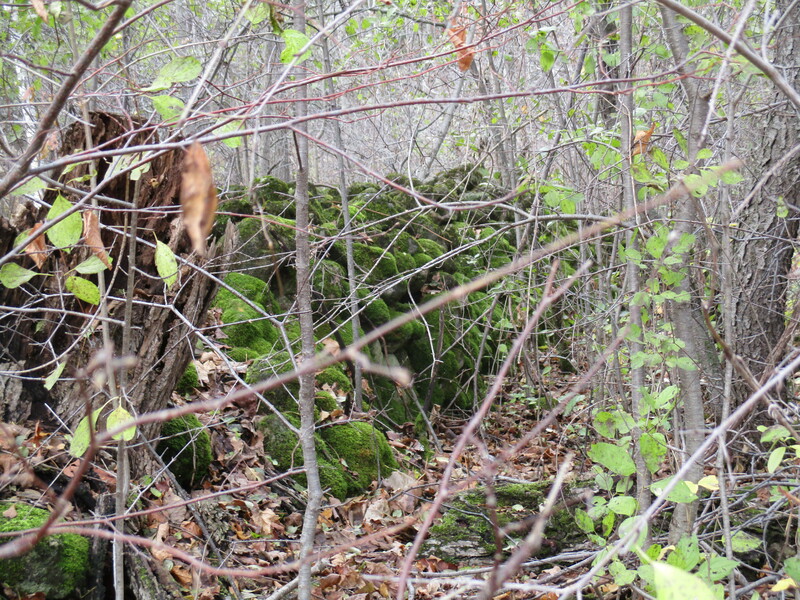 Now the stone walls are running through the forest where once they would have divided fields. 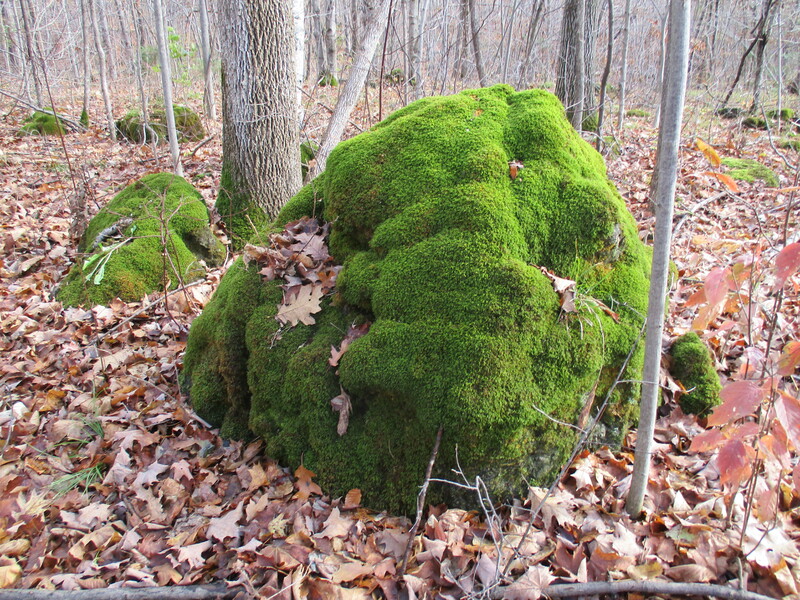 Like other surfaces in the area the stone fence is covered with a thick layer of moss. 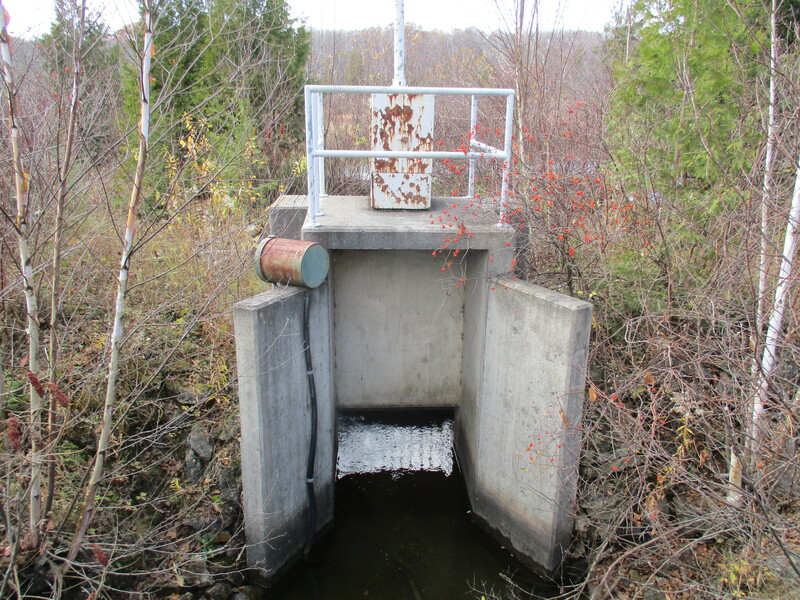 The water in the wetlands is controlled by means of a modern sluice gate. The pipe on the top houses the cylinder that presses a metal plate down to seal the flow of water. Following Sixteen Mile Creek we came to a place where the sunlight sparkled on the water as it vanished over the crest of a waterfall. In 1830 Henry Young gained title to lot 8 in the fifth concession. He allowed Edward Hilton to build a saw mill in 1835 which Hilton operated until 1837. This was when he decided to leave to fight in what came to be known as the Upper Canada Rebellion of 1837. The mill was left to rot and it appears Hilton didn’t return for about twenty years. Hilton gave his name to the falls although he only operated a mill here for a short time. 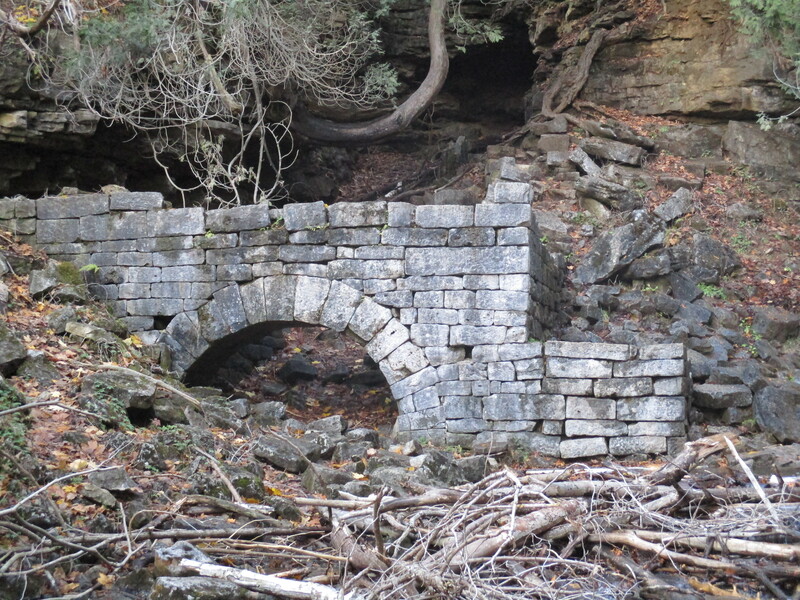 Hilton Falls plunges over the escarpment and provided the power to turn the water wheel for the saw mill. In 1856 the site was purchased by Dr. George Hamilton Park who had the mill rebuilt. He likely bought it under speculation and it was operated under several names until 1863 when it burned down. At the foot of the falls stand the remains of the water wheel housing from Dr. Park’s mill. This cut stone structure supported a wood and iron wheel that was reported to be 40 feet in diameter. Estimations of the site suggest that 26 feet was more likely the size. The water was brought from a mill pond above the falls through a flume to the top of the wheel. The stone arch provided an exit for the water after it turned the wheel. The wheel housing and the mill were solid construction. The saw mill was 30 feet wide, 50 feet long and stood 18 feet tall. The wheel housing can be seen below as well as in relation to the falls in the cover photo. Along the way back we decided to take a brief trek along a side trail near the sluice gates. Here we discovered this small pond. The white rock along the far shore of the pond is another large glacial pothole. 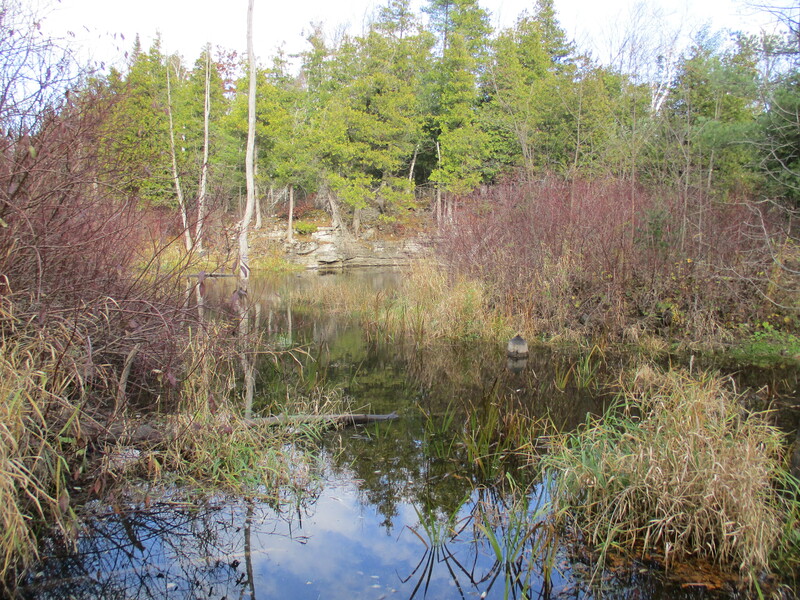 Ontario’s crown forests cover almost two thirds of the province. When almost all of the original tree cover was harvested in the first century of settlement the government set out a program to encourage reforestation. Tax grants were made available to people who planted a portion of their land with forests. The land in the escarpment was poor for farming and was often reforested with trees planted in straight rows as seen below. 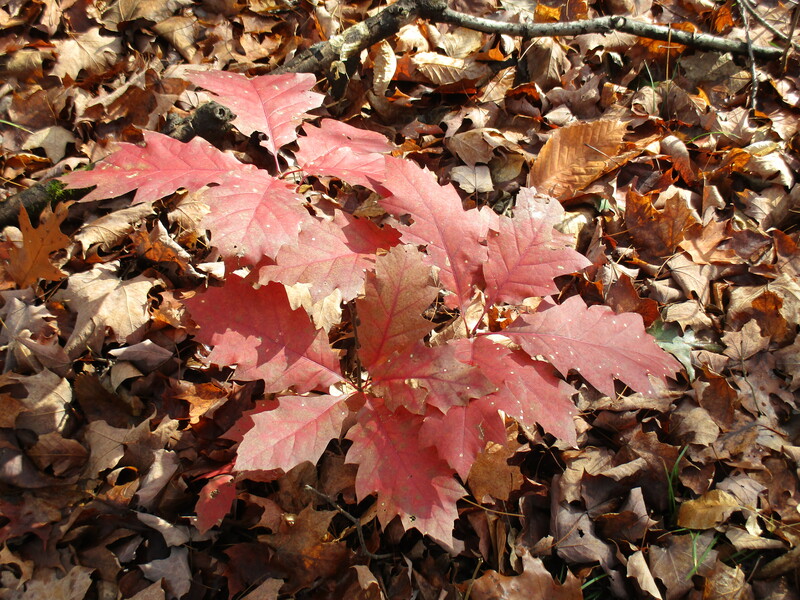 This small red oak tree has it’s bright red leaves shining in the fall sunlight. This tree can grow very fast and in 10 years can reach up to 20 feet tall. As noted earlier, the growing conditions here will likely cause it to die before it reaches it’s potential of 500 years old. The Niagara Escarpment was named a World Biosphere Reserve by UNESCO in 1990. Development and land use are strictly controlled along the escarpment. Mineral extraction is one of the permitted uses of the escarpment under tightly controlled conditions. 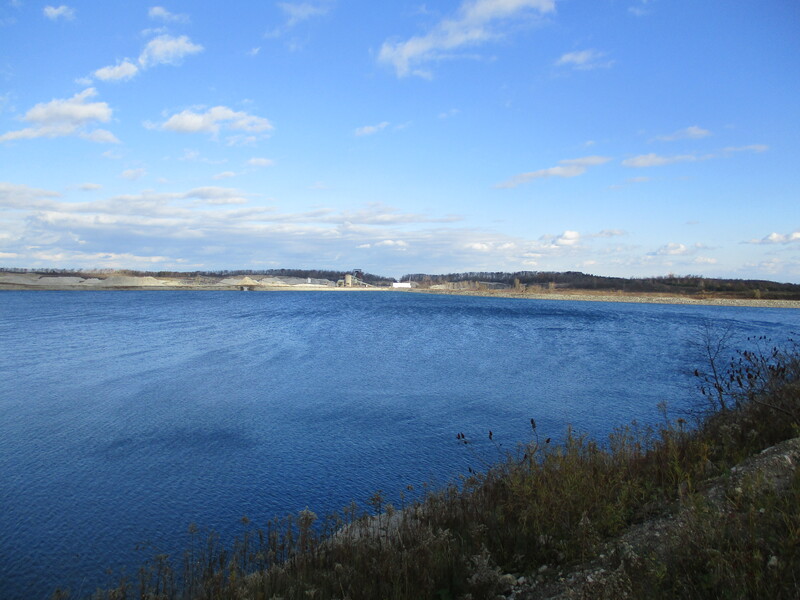 The Milton Quarry is across the street from where we parked and has filled up with water. On the far side of this photograph is a white building. Behind it a foot bridge carries the Bruce Trail across “The Gap” in the escarpment. This gap can be seen from the 401 and was created in 1962 when the quarry was opened. The trail over The Gap makes for a fun hike that I hope to repeat soon. Taking the scenic route it was 5.9 km to the falls but the more direct route back was only 4.26 km for a total hike of 10.25 km. 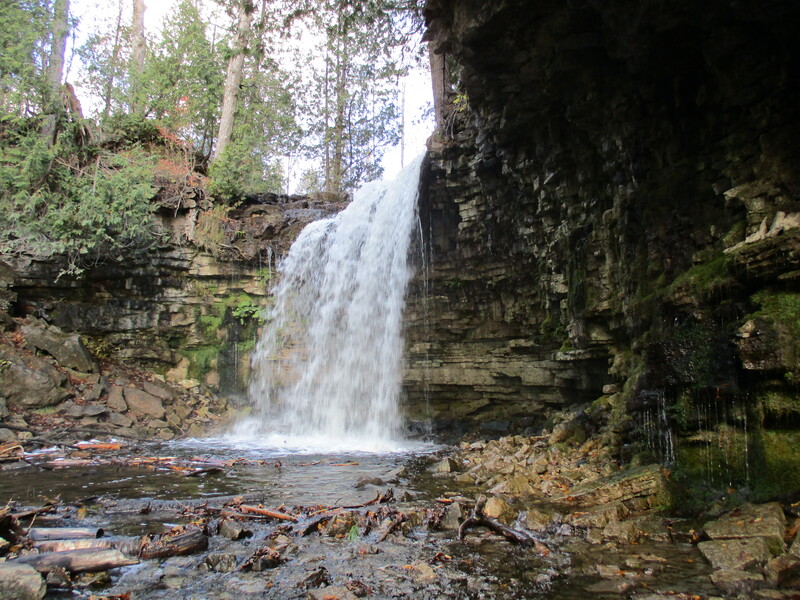 This is a lengthy hike but there is a shorter means to access the falls from Hilton Falls Conservation Area. 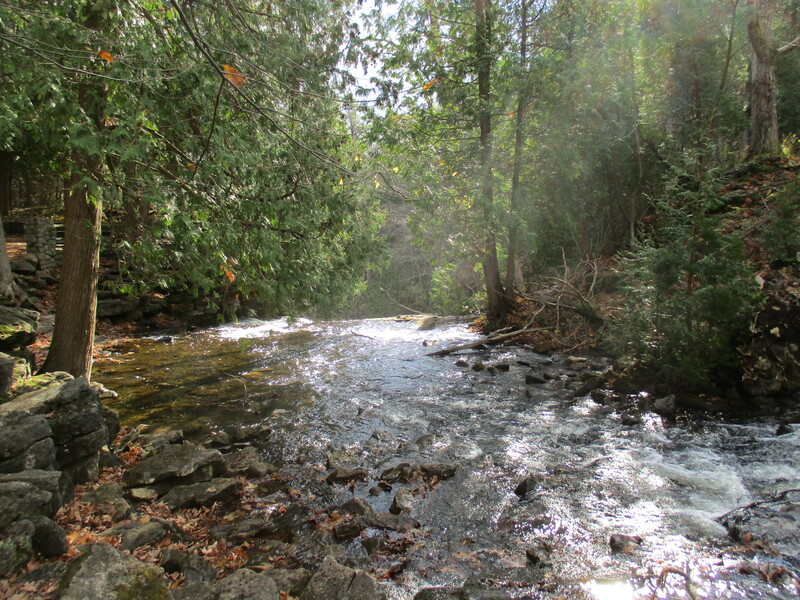 This entry was posted in Sixteen Mile Creek and tagged autumn meadowhawk, Bruce Trail, Hilton Falls, Milton Quarry, Pothole, Red oak on November 3, 2015 by hikingthegta.